There is only one required piece of safety equipment for all soccer players, and that’s the shin guard. An entire game played almost exclusively by kicking is going to result in a lot of shins getting hacked, and the smartest thing to do is cover that area with a protective amount of padding. When we first start playing soccer as little kids, all we know about shin guards is that there’s an extra thing we have to put on. This thought lasts until we get hacked by someone on the other team who thought that’s where the ball was. It’s pretty annoying but doesn’t hurt…and then we realize why we spend the extra time gearing up. When looking for a new pair of shin guards it’s a good idea to consider your position on the field and your style of play. If you’re a defender who’s going to be doing a lot of stopping and blocking, you want something with a bit more protection. If you’re a nimble attacker looking for the biggest advantage in speed, you’ll want the lightest and lowest profile guard available. The ​G-Form Pro-S Elite Shin Guards are different from your standard slip-in shin guards. They’ll need to be put on before your socks, but don’t let the extra bit of effort scare you away. Constructed with a focus on both comfort and protection, it’s great jump forward in shin guard technology and design. They are a bit more expensive than our other choices but well worth the money. G-Form has created a proprietary and patented molded composite that that allows the pads to stay soft and only harden on impact.This Reaction Protection Technology provides flexibility throughout the entire guard while running or sliding, and excellent protection when the ball or a stray kick reach your shins. In addition, the low-profile nature of the pads will keep them from getting in the way of your socks or feeling too bulky on your shins. At the base of these shin guards is a moisture-wicking, UPF 50+ compression fabric to keep the player dry and comfortable. They are lightweight, breathable, and the sleeve design helps them to stay in place. Another benefit of the sleeve design is added calf compression which can promote blood flow, helping to prevent fatigue and cramps. ​Even though the design looks a little odd, the G-Form Pro-S Elite meets NOCSAE and CE standards for play throughout the USA and EU. They are also one of the few sets of shin guards around that are machine washable, but be sure to follow the manufacturer’s instructions. Overall, this strong and flexible advancement in protection technology is worth the extra money. Going back to the classic “slip-in” shin guard design, the ​adidas Performance Ghost Pro Shin Guards add a new multi-shield design that helps these guards perform at a high level. They come with a pair of breathable sleeves to keep them in place and are available in an assortment of colors. This set of shin guards is made of 3 different shields fitted together for highest flexibility and perfect fit. This shell should give you excellent protection from striking impact. The padded backing is made of soft and durable EVA foam to absorb additional pressure on the shins. Channels within the guard allow for ventilation so your legs don’t feel like they’re overheating. It’s not recommended to wear these shin guards without soccer socks covering them. ​Even though they come with an included compression sleeve, you’ll experience them moving around quite a bit without the extra support of a long sock. Reviews mention that these guards run small and recommend ordering a size up from the manufacturer size chart. If you need a pair of backup shin guards for practice or as a spare to keep in your bag, you don’t want to spend a lot of money. Consider the ​Vizari Malaga Shin Guards as an option for days when you forget your main set. These are listed as made for youth players, but the sizes go all the way up to an adult Large (for players up to 5’11”). This is a great design for smaller players who are looking for a little more protection in the ankle area. You have to pull these shin guards on before your socks, but you really can’t get ankle protection without a design similar to this. In addition to the thin and strong polyproylene shell, these have foam padded backing for comfort. They boast super lightweight, all-around protective construction. ​For adults, it’s highly recommended that you order the largest size available. For kids, be sure to read the size charts shown in the reviews. Without any chart available in the product description that’s about the best you can do. Sometimes players gravitate toward a specific brand, either from personal preference or because their fellow players offer recommendations. Since we already recommended a pair of shin guards from adidas it’s only fair that we show you the ​Nike Mercurial Lite Shin Guards. These shin guards bridge the price and performance gap between the G-Form and adidas recommendations we previously mentioned. These shin guards are designed with a strong, lightweight, K-resin shell to help guard against impact you will experience in practice or matches. This shell is also low-profile to make sure it doesn’t get in the way of your socks or your touches. One of the standout features of the Mercurial Lite is the waffle-patterned EVA backing. This creates additional airflow around your shins to reduce sweating and keep your guards in place while also dispersing energy from impact. The Nike Guard Lock Sleeves are seamless and made of dry-fit material for breathable calf compression. They are designed with a contour to provide a comfortable, secure fit during intense action. These shin guards are very lightweight and very small. They are intended for players who want to get just enough protection on their shins to fall within the rules, even if it only protects a small amount of the leg. For attackers who are looking for the least obtrusive protection that won’t limit their mobility, these are the way to go. If you’re looking for a pair of shin guards that have the flexibility of our top pick G-Forms but don’t want to spend that amount of money, it’s worth looking into a cloth type shin guard. This type of guard pulls on like a pair of socks but directly over your leg. They’re generally recommended for younger players because they are so easy to put on as opposed to slide-in shin guards. 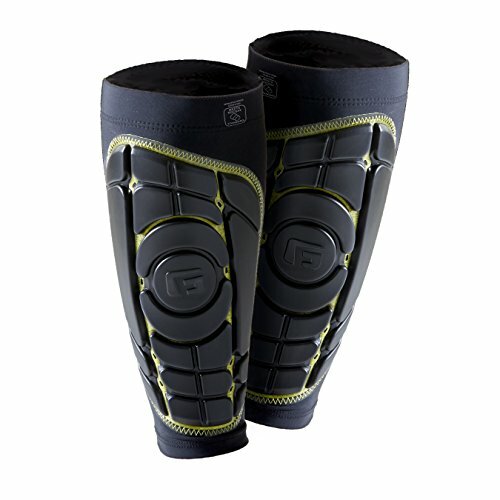 A very modest, yet popular, pair of these cloth type are the ​ProForce Shin Guards. There isn’t much in the way of advanced features here, they’re basically a sleeve with an attached piece of foam. As simple as the design is, they’re extremely comfortable since there isn’t a hard plate attached to them. These shin guards provide very good protection for younger soccer players, but adults should be wary. As bodies get bigger and kicks get stronger, they can’t protect the player as well as shin guards with a hard outer shell, or newer technologies that harden on impact. ​If you want something that’s extremely comfortable for practice these are a great choice, but we wouldn’t recommend them for adult match play. When you’re looking for a pair of shin guards for your child you need to consider both protection and ease of use. If they can’t put them on easily and correctly they won’t want to wear them, an ankle sleeve/hard shell combo is a great choice. Multiple color choices are available for picky kids. 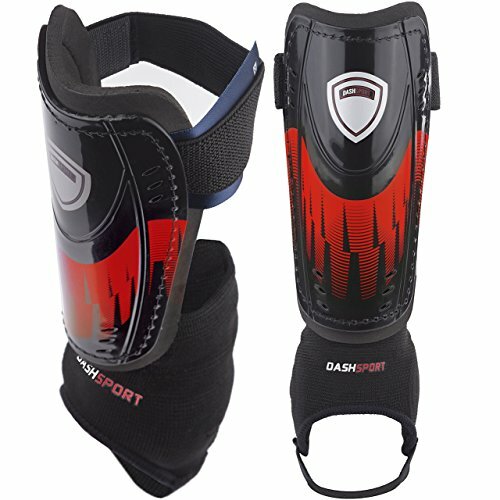 These DashSport Soccer Shin Guards have a light and durable hard polypropylene shell to protect the shin. Padded foam on the inside helps distribute impact and keep the guard more comfortable on the leg. The cushioned ankle supports help protect tender ankle bones and create a handy target to slide the foot through to set them up for perfect positioning. ​Be sure to look at the size chart provided by the manufacturer. This chart gives general sizes based on height and age, but also gives the specific size of the shin guard so you can measure it against your child. Already recommended as our “Best Cheap Soccer Shin Guards,” the Vizari Malaga is an excellent choice if you’re looking for a lower-priced set of guards for your child. These leg guards aren’t shin guards by themselves, instead we would consider them a shin guard accessory. Many of the highest rated shin guards slip into an included sleeve that holds them in place and adds a small amount of compression. Storelli’s ​BodyShield Leg Guards are a highly protective upgrade from standard sleeves. While a standard shin guard protects the area in the front of the lower leg, these guards add additional impact protection to the sides and back of the lower leg, as well as the inner and outer ankle. 3mm of stretchy Poron XRD® padding in these areas is soft and comfortable when worn, but does an excellent job of absorbing impact. 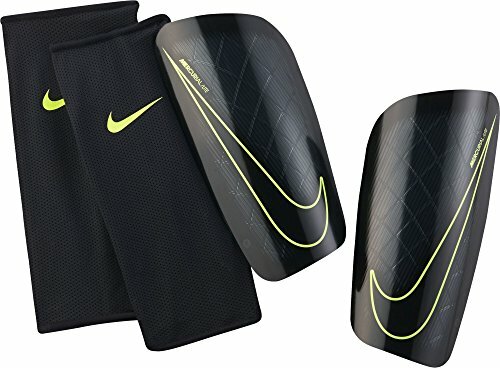 These hold shin guards in place like regular sleeves, but the better material adds an additional amount of calf compression that you can’t get from standard lycra and other thin materials. A latex grip elastic band holds the Leg Guards up so they don’t sag. One of the best features, a built-in shin guard pocket, holds your shin guard perfectly in place so you don’t have to worry about it sliding to the side of your sleeve. This is a product built for people whose lower legs take a lot more damage than the average player. If you’re a defender or any player whose strong challenges cause impact more often than not, or an attacker who always gets hacked, we’d recommend this added layer of protection. The most basic form of shin guards is the slip-in. These guards typically sport a hard outer shell to absorb initial impact, with padding to disperse the pressure across the shin instead of focusing it in one place. Slip-ins will normally come with a compression sleeve. This sleeve is used to hold the shin guard in place. We still recommend that players wear a sock over the sleeves for additional stability even if you’re at practice or in another non-uniform situation. Some players choose to wear the slip-ins without a sleeve and just shove them straight between the sock and shin. Without an extremely strong sock this will allow a shin guard to slide around quite a bit, so tape wrapped around the outside of the sock is often used to hold the guard in place. A pair of slip-in guards will normally provide players with the most mobility, but this can sometimes be at the sacrifice of additional protection. One of the easiest types of shin guard to put on correctly, the sleeve style is one piece (normally made up of separate segments) that simply slides over the foot and onto the lower leg. Just make sure the the padding faces forward. Meant to provide a larger area of protection, this style of shin guard is a great choice for younger players. Because of the all-in-one construction, thicker materials are able to be used in the area that wraps around the calf. This can provide a higher level of compression to increase blood flow to the lower leg, reducing the change of cramping and fatigue. Sleeve style shin guards are normally extremely flexible. Because the protective element has to be combined with the entire construction and the ability to slide over the foot, a hard shell isn’t possible with this type of guard. Flexibility helps the shin guard conform to the lower leg around the bones and muscles that make up the shin, making the fit closer than a standard slip-in can reach. This type of guard is a mix between a slip-in and a sleeve. The guard structure is a large piece that is pulled over the foot, with ankle protection, and normally has a velcro strap at the top to add stability. 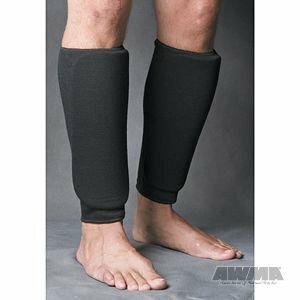 This is one of the types of shin guard that can be worn comfortably without socks since there is an additional level of support with the velcro strap. 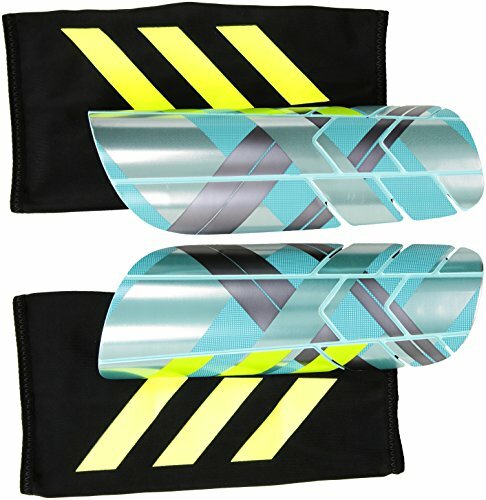 Just like sleeve shin guards, these are an excellent choice for youth players because of the ease of placement. Slide them on, and make sure the protective part is facing forward. This style has advantages of both sleeve and slip-in guards. They provide extra protection around the ankles, but also leave the area behind the shin open for ventilation. The main protective layer can also be a hard shell because of the hinge construction. Different positions and different playing styles will need different amounts of protection from their shin guards. As a blanket statement, defenders need more protection, and attackers want fewer things to bother them. Midfielders are somewhere in between, and goalkeepers…well, who knows what they want? The job of a defender is to stop and redirect the action coming their way. A lot of the time this involves tackles and challenges that immediately put their lower legs in harm’s way. With shin guards, its the same as with finding cleats – look for a durable pair that is robust and sturdy. Their position is generally not based on mobility, so a more robust amount of protection shouldn’t bother them when tending to their normal defensive responsibilities. Additionally, something as simple as a blocked shot can hurt quite a bit if it strikes the lower leg just right. For a player who primarily plays defense, we’d always recommend the highest protection available. 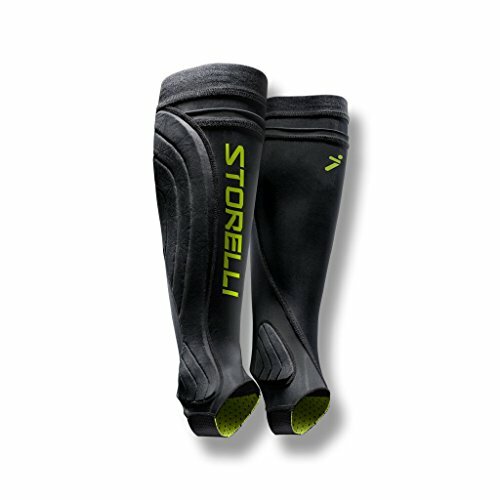 The combination of a pair of effective padded sleeves like the Storelli BodyShield Leg Guards along with high performance slip-in shin guards would be the most effective. A player in midfield normally splits their time between attacking and defending, so they require a balance between high mobility and high protection. At the higher levels they split into more specific roles, so a defensive midfielder can focus on more protection, while an attacking midfielder can get a set of shin guards that allow for more mobility. In general, a midfielder should look for a pair of shin guards that cover a larger area than your standard striker guards but don’t weigh them down. At advanced levels, a slip-in guard that covers the majority of the shin would be a safe bet. For a beginner, a good quality sleeve based shin guard would be a good choice. Forwards need to be quick on their feet, able to dance around defenders, and take quick shots from angles that bend their legs in strange directions. They are also the ones who get kicked in the shins the most often. Thus, even though they may get more bruised up in the process, a smaller shin guard is the answer. The type of shin guard worn by a goalkeeper is completely up to personal choice. The majority of a goalkeeper’s protection is focused on the hands, where his primary responsibilities lie. This is why this position spends most of its efforts for equipment on finding a top goalie glove model. However, keepers also use their feet quite a bit, whether blocking low shots or sliding into tackles.If a goalkeeper’s primary method of saving is to always use the hands and to dive head first, a small, light shin guard is a fine choice. However, if a keeper dives foot first quite a bit or decides to roam around with the ball at their feet, they might want to consider a higher level of protection. Shin guards are required equipment in every different level of soccer. In the United States, the National Federation of High School Associations (NFHS) sets regulations for all equipment used in a game. The NFHS began requiring all high school soccer players to wear shin guards approved by the National Operating Committee on Standards for Athletic Equipment (NOCSAE) in 2008. A list of which shin guards have been submitted and accepted for NOCSAE approval can be found by searching through the website at https://www.seinet.org/search.htm. However, the models displayed are only ones who have submitted their products for voluntary testing. Many shin guards not on the list have a tag which displays “Meets NOCSAE Standards,” which is good enough for the NFHS. Check to see if your guards have this tag before getting on the pitch in a high school match. Be sure to check the rules of any soccer organization you join to make sure your shin guards are approved for match play. Going onto the pitch without shin guards at this point, in addition to being a uniform violation, just seems like a silly idea. They should be thought of as part of the uniform, just like the team jersey or matching socks. And they’ll help keep you from waking up the next day with a golf-ball shaped lump on your shins. The correct pair of shin guards can be critical to your game. If you’re worried about protection, get a pair with more padding. If you’re worried that they’ll get in the way, get a smaller pair or ones with a lower profile. Just make sure you wear them!